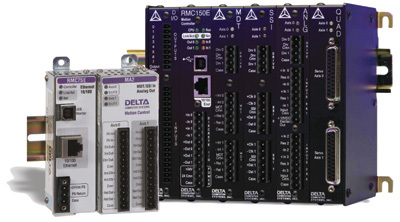 Delta Computer Systems, Battle Ground, WA, will showcase its RMC75E and RMC150E closed-loop motion controllers, well-suited for metalforming applications such as presses because they can control force as well as position, and can transition smoothly between the two control modes. The units also can synchronize the motion of multiple motion axes-RMC75 controls one or two axes, and RMC150 can control as many as eight motion axes. Also on display: RMCTools software, which simplifies integration of the controllers. Delta's Plot Manager software gives a visual record of the motion; a motion simulator enables motion systems to be developed and checked out before the hardware is connected.